Take a tablespoon each day to improve your digestive system! 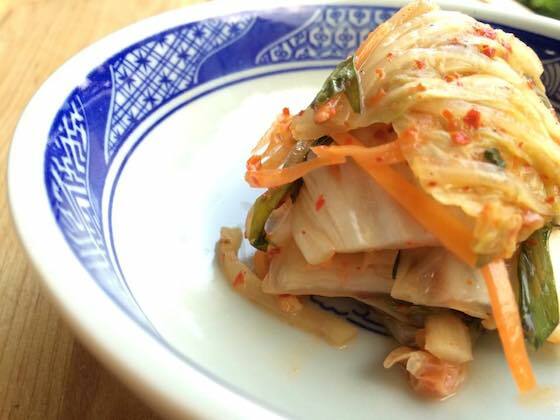 The following recipe was adapted from Maangchi’s Tongbaechu-kimchi as my husband doesn’t take onion or garlic and thus never had a good experience with kimchi. Cut the cabbages into quarters lengthwise, leaving the bottom intact so that the leaves are still attached to each other. Rinse under running water, this ensures better adhesion of the salt in step 2. Rub salt on each piece of leaf, taking care to put more on the hard stem than the leaves. Place it in a bowl / tub / pot. Set a timer to turn the cabbages every 30 mins so that they are properly salted. You will see water at the bottom of the tub. Leave them there as you turn the cabbages. At the end of 2 hours (or until properly salted, I tear a piece of cabbage to try) rinse the salt off each leaf of the cabbage under running water. (I wash them in a total of 3 times, again tearing a piece of the leaf to see if it’s too salty). Mix water and the flour together. Pour into a saucepan at medium heat. Taking care to stir constantly. When it started to boil, add the brown sugar (white sugar also works) and cook for around 1 minute. The mixture will turn glossy and smooth. Prepare white radish, carrot, ginger and chinese celery at this point while mixture cools. When the flour-water has cooled down, add all ingredients together in a bowl and mix well. Smear the paste on each leaf of cabbage, ensuring all surfaces are coated. Put them in a food-safe plastic container or glass container ensuring that there’re around 1 inch of space from top of container. Press the cabbage down before closing so that all the air at the bottom has escape. Leave the container outside for 1-2 days to let it ferment. Once fermented, it can be stored in the refrigerator for around 2-3 months depending on how you use it. You can tell when fermentation has started when you press the cabbage down on and there’re bubbles in the liquid. 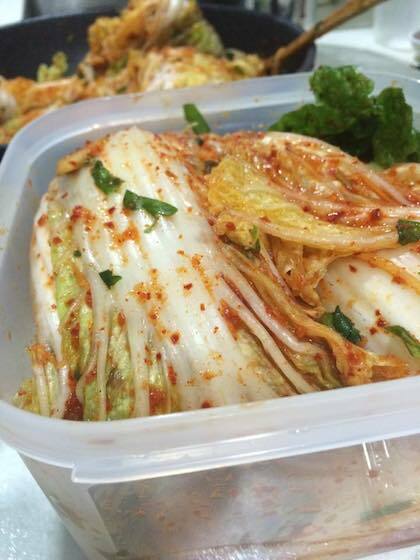 Always press the cabbage down when you take some kimchi out so that it is always submerged in the juice. This will prevent mould from forming on its surface. I used only Ginger and Chinese Celery. The original recipe used garlic and onion and fish sauce. Hi Savitri, it’s essential to use the flour to create the paste. This is the authentic way of making Kimchi. I guess you can omit it and just have water with the rest instead but I can’t be sure that it will work. If you have done so, do let me know. You can substitute cooked rice. It’s not a big deal. Thank you so much, yo have no idea how happy I’m to find this recipe I’m going to make it this weekend will let you now how it goes. My husband and I are vegetarian and we don’t eat onion or garlic family vegetables. Do you have recipe to make vegetable broth with out OG? thank you!! Hi Komi, sorry for the late reply. I usually use carrot, burdock, celery, cabbage and mushrooms to make my broth. Actually any vegetable scraps can work too. I usually keep the stems of broccoli or other unwanted vegetable parts and store them in the freezer. When I want to make soup stock, I will fill a pot with water and dump them in together with other vegetables that I would like to have. Recently I found adding French beans add really interesting flavour to my soups! Thank you so much for this recipe! As I am allergic to garlic, finding a kim chi recipe without it is fantastic! I looked last year for this no onion no garlic recipe without finding anything. Thank you so much for this. After filling the jars with cabbage and vegetables, do you submerge the vegetables in water for the fermentation process? There’s no need to submerge the vegetables in water. They will release water as the fermentation occurs. In fact, adding water may cause mold to grow which we want to avoid. The juice doesn’t cause mold to grow as the acidity of it prevents that. Hope that helps.